The farther down the hallway we travelled, the more I looked forward to what Maddy was going to take off her cart. 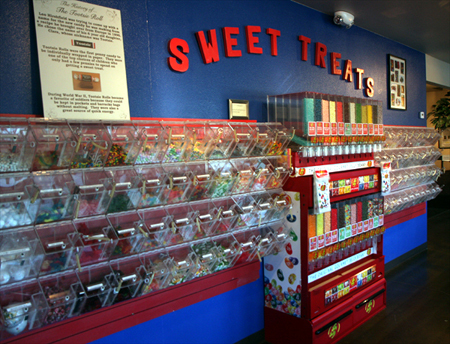 When in Bend, a must-stop for anyone who has a sweet-tooth is Goody’s. The chocolate and ice cream business, which started in Sunriver in 1984 as a small ice cream shop, has grown into a franchise with several stores around Central Oregon and even on in Idaho. The amazing part is that when you tour their headquarters, you learn an important fact, everything is hand packaged and there are limited use of machines – this operation is a labor of love. We visited on a factory on a cool Fall Sunday, and even then in the kitchen there was a staff mixing up the ingredients for their next batch of goodies. On tap? Pumpkin fudge that sounds as good as it tastes. The tour features a walk through a hallway that surrounds the kitchen. Picture windows offer you a glimpse into the process that this locally-owned sweets store uses to make some amazing treats and ice cream. Local milk, butter and other ingredients are featured, and the process is surprisingly low-tech. When she stopped at each of the six picture-windows, she would hand out a sample of what was being made, packages or mixed. It was the best tour ever! Now if chocolate, ice cream and fudge aren’t your guilty pleasure of choice, yes, they even make hand-made caramel corn. Known throughout the region as the best you can get, Maddy told us that during the summer months the kitchen staff will make up to 60 batches a day, and still not keep up with demand. Julie Christensen, director of operations at Goody’s said that the new headquarters building opened in June 2011, and since it has been a very popular spot, with more than 300 visitors a day during the summer months. What this should tell you is that if you are going to visit, especially with a larger group, it’s best to call ahead to make sure you will get a guided tour. Inversely, during the off-season in fall and winter, and on weekdays, the tour can be self-guided because the limited numbers of visitors. But don’t worry, at the end you will still get some free samples. The tour of the commercial kitchen takes about 15 to 20 minutes, depending on how many questions you as ask. At the end, after sampling ice cream, you are in the Goody’s showroom, where they have a wall of candies, a display case with truffles and fudge and other items you wouldn’t expect to be dipped in chocolate. Personally I am addicted to chocolate-covered potato chips, which surely makes my doctor cringe. They also have a counter for all of their locally-made ice cream, so don’t forget to get a cone or a bowl – if you are going to break the diet, might as well go all the way. About the Goody’s: Goody's is a family run tradition of handmade chocolates, candies and ice cream. First created by Marne and Marion Palmateer in Sunriver, in 1984, Goody's Candy Store very quickly became a legendary and loved Central Oregon tradition selling assorted candies purchased for resale. Dane and Jvon Danforth purchased the company in June of 2007, excluding the Boise store which is owned and operated by Brett Palmateer. The Danforth’s opened another store in Redmond, OR in November, 2007 and continue to provide the same quality products that Goody’s in known for. What to bring: Your sweet tooth. If you are diabetic, stay far away. But if you are a lover of all things sweet, this place is your holy land in Central Oregon. With shops sprinkled around the region, from Redmond to Prineville and Sunriver, don’t miss this chance to try some fresh, local chocolate and treats. Tip: Since this is a medium-sized business with local roots, don’t expect a Hershey tour or a Tillamook Cheese Factory experience. This is a small candy operation, and you get the family-feel and the tour is very intimate. If you have a big group make sure to call ahead to reserve your time, and during the off-season, if you want the guided tour, calling ahead can also get you a tour guide. Also, while you can take pictures of the kitchen area, you are doing so through a window. If you can, turn off the flash setting on your camera if you want to capture the action. Season: The stores are open year-round. Getting there: The address of Goody’s Chocolate and Ice Cream Factory is 1111 SE Division, Bend. It’s about a half mile away from the Old Mill District in Bend, off of Division Street and is clearly marked.